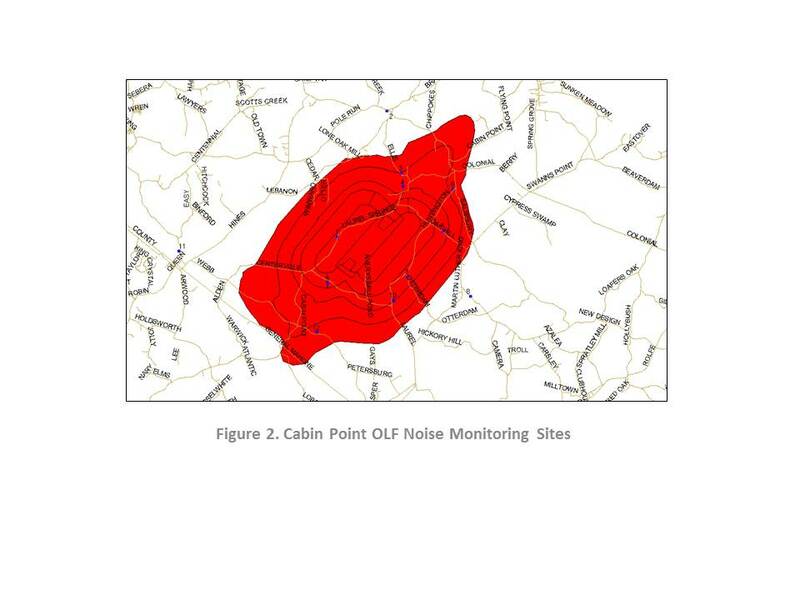 The following summarizes acoustical analyses performed by David Coate Consulting (DCC) to analyze potential noise effects associated with the Navy's proposed outlying landing field (OLF) in Virginia. 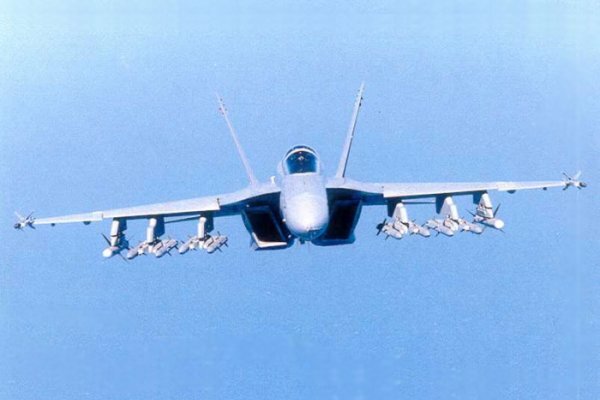 The noise analysis is focused on the introduction of the F18 fighter jet which would be based at the OLF. ‘Ambient noise’ refers to the sum of noise from both natural and manmade noise sources at any given location. 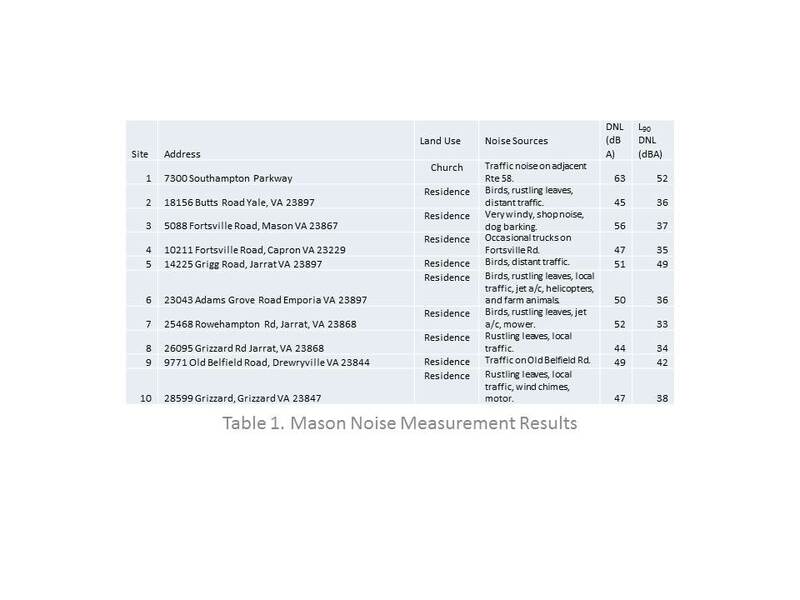 The measurement and characterization of ambient noise is an important part of environmental noise studies because people judge the acceptability of a new noise source partially on the basis of the existing noise environment. In general, the greater the difference between the noise level of a new source and existing noise levels, the greater the level of annoyance. 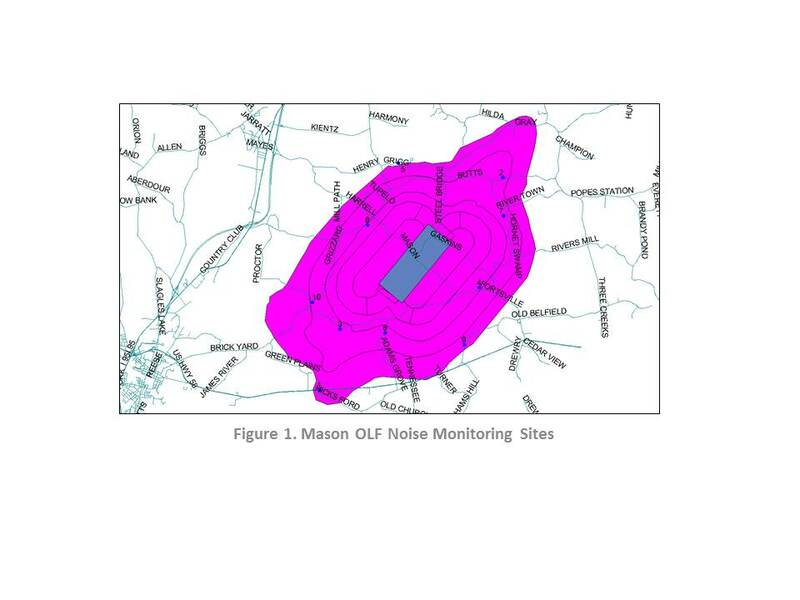 Ambient noise monitoring was conducted in the OLF study area. 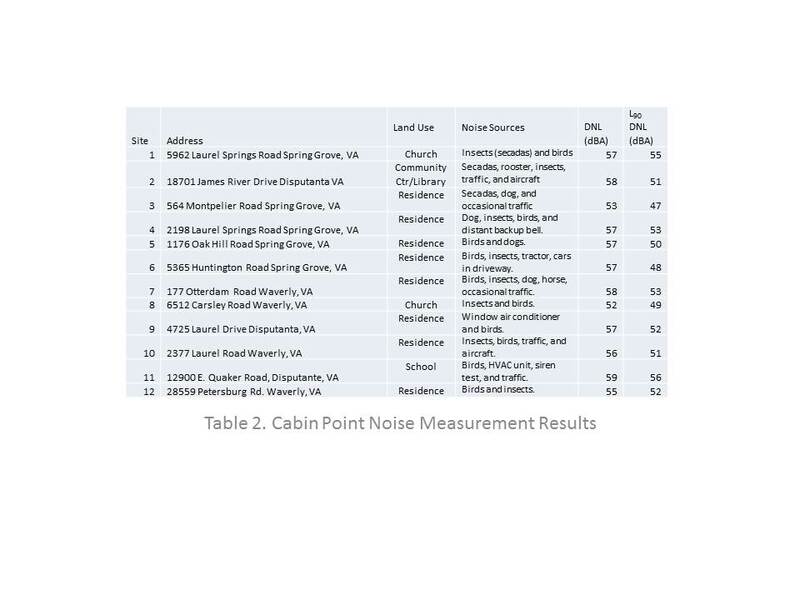 Noise monitoring locations in the Mason Area are shown in Figure 1 and Cabin Point Area noise monitoring locations are shown in Figure 2. The noise measurement results are shown in terms of DNL and L90 DNL in Tables 1 and 2. The L90, commonly used to represent the background ambient noise level, is the level exceeded 90% of the measurement time period. The L90 ‘filters out’ anomalous noise events which may not be representative of the long term average background ambient noise level. The SEL in this equation is measured where the person is sleeping, so exterior noise levels must be adjusted according to the Noise Level Reduction (NLR) of the house/room façade. NLR values vary substantially by house and by room within a house and depend on the weakest acoustical path which generally is the windows and doors. Since sleep disturbance depends on specific SEL values, calculating SEL from equation (2) will produce average SEL, which would therefore only provide an average probability of awakening from equation (1). K = the number of events. 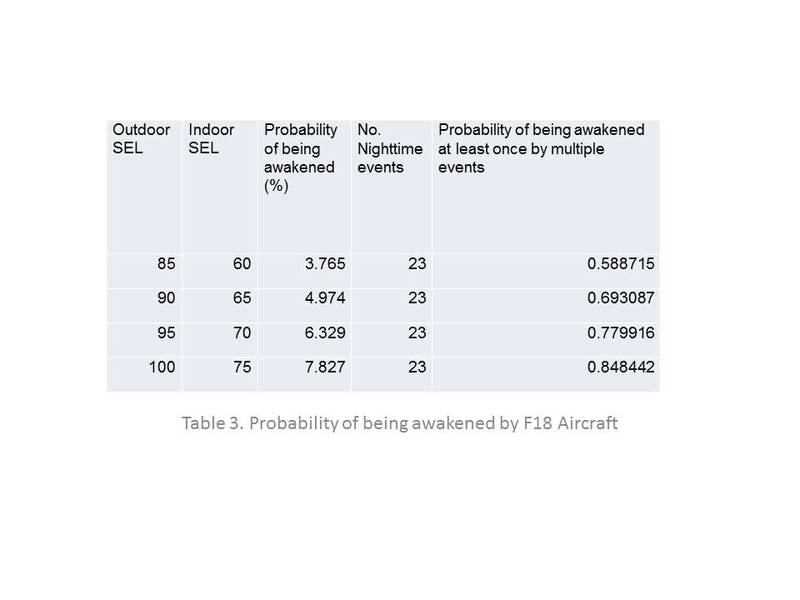 Based on the probabilities shown in Table 3, and year 2000 census population data underlying the noise contours, one can estimate/calculate the number of people that would be awoken at least once per night due to F/A 18 operations at each candidate OLF site. 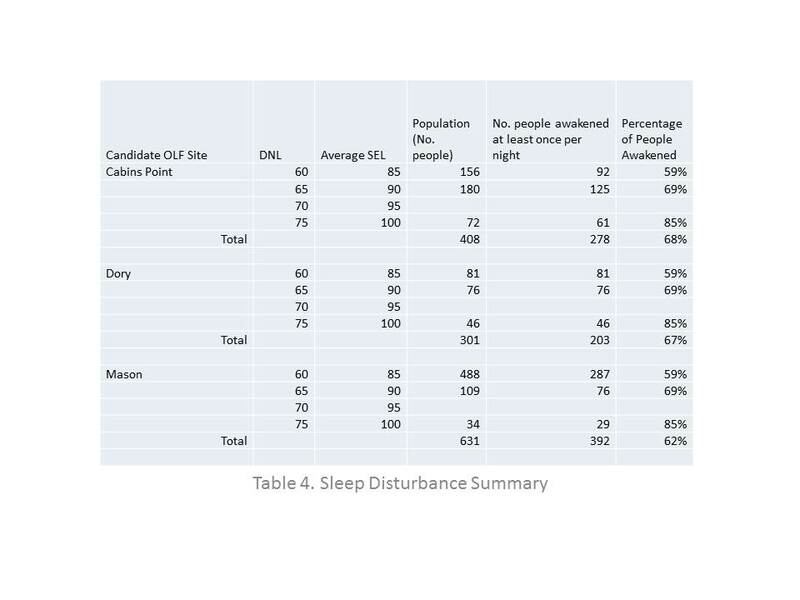 These results are shown in Table 4.